I drink a lot of Tecate beer, they seem to have a monopoly of some sorts in Mexico. But Tecate is a lot more than just a beer. The town of Tecate — where the beer is made — is a small border town about 45 minutes east of Tijuana. As it was pointed out to me this weekend, Tecate, unlike many border towns, is a Mexican border town, rather than an American border town. There is a Tecate, USA just north of the border, but it exists because of Tecate, Mexico, the town just south of the border, not the other way around. Before recently I had only been to Tecate once. We drove down from San Diego, parked on the US side of the border and walked across. The central part of the town, the plaza and the brewery are within a five minute walk from the border, which makes it really convenient for tourists to get around. The first time I went a few years ago the brewery was closed by the time we got there but we spent some time wandering around town, took in the wonderful plaza in the center of town and had some cheap Mexican food. Five years ago or so, an English teacher I had at Grossmont college recommended I read a book called Enchiladas, Rice and Beans by a writer named Daniel Reveles. I picked up a copy and read it, it’s short stories about people in Tecate. Daniel Reveles I learned retired to Tecate after working in Hollywood and started writing books. 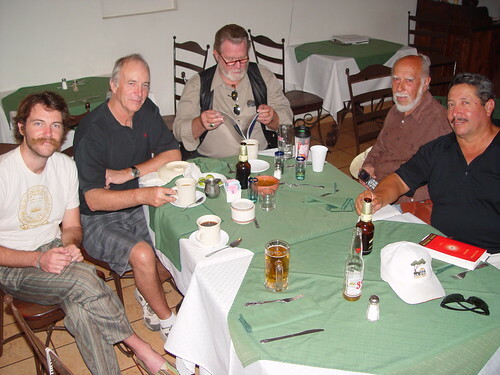 The stories usually follow one or two characters around Tecate and tell stories about the people and the place. They have a bit of mysticism, but are rarely impossible tales that couldn’t really happen. After I moved to Tijuana a few months ago I started thinking about this book again. Tijuana is nothing like Tecate, the only thing they have in common is that they’re both on the border with the US. Tijuana has about 1.5 million people, it’s a real city. Tecate has about 150,000 people, it just barely qualifies as a large town. I looked up Daniel Reveles and found a story about him from a few years ago in the Union Tribune, I saw that he has released a couple books since Enchiladas, Rice and Beans which was his first. Last week I picked up a copy of his second book, Salsa and Chips at the library and started reading it. As far as I can remember it’s much like the first book. Short stories about the people in the town of Tecate. Saturday morning Kinsee and I woke up and decided to drive out to Tecate and try to find Daniel Reveles. If his stories could be believed we assumed we would be able to find him wandering through the plaza on a Saturday afternoon, having a drink at Bar Diana or maybe dining at La Fonda restaurant. After a lazy morning and a late start we hit the road to Tecate. There are two ways to get to Tecate from Tijuana, a toll road that costs $75MX, about $6US, each way and a free road that is slower, farther out of the way, and presumably more dangerous. I’ve heard stories that often times the pavement just disappears and one finds them self driving on gravel, that speeding trucks don’t always mind the yellow divider line in the road, and that if you get a flat you might not be able to find a shoulder to pull over on for a while. In order to save time after our late start we decided to take the toll road, but when I missed the turn off and we saw a sign telling us the free road was just ahead we decided not to backtrack and take the free road. We drove through the outskirts of southeastern Tijuana, the farther we got from the center, the more poverty there was. The neighborhoods and houses reminded me of Salvador Brazil, but without the beautiful beach on the other side of the road. After about twenty minutes we were out of town and cruising along the road. While passing the municipal dump we saw smoke rising from the ground, Kinsee tells me it was methane from the cows. After what I thought was far too short of a drive, we arrived on the outskirts of Tecate. We parked near the plaza and walked to the brewery. We found the gates locked, the attendant told us they were closed. But then when we pointed out that the sign said they weren’t closed yet he let us in, they were however done giving tours for the day. We got to look around the garden and drank our complimentary beer. While drinking we got to talking to the guy at the bar. I told him this was my second time coming and that both times I didn’t make it in time for the tour, he gave us his email address and told us to let him know next we’re coming and he’ll schedule a special tour. We walked back to the plaza and just wander through. Small restaurants line one side with tables outside. One of the first thing I noticed was white people. In Tijuana it’s very rare to see any other white people, tourism is nearly nonexistent. But in Tecate there were plenty of Americans walking around eating and shopping. It’s obvious the plaza is a social focal point of the town. There were families with kids running around playing, teenagers that appeared to be on dates, old men playing chess, as well as vendors selling anything you could want, everything from cowboy hats and leather products to cotton candy. While wandering around the plaza we stopped to watch the old men playing chess, looking for Daniel Reveles, wondering if he still looked the same as the picture on the jacket of his latest book. A man of about 60 sitting on a bench asked us if we were enjoying our time in Tecate. We got to talking to him, in Tijuana I would have assumed he wanted to sell us something, but this man just wanted to talk, wanted to make sure we were enjoying ourselves and finding everything we were looking for. He made sure we had gone to the brewery and recommended the bakery down the street. He told us that he’s lived all of the US, everywhere from Florida to Alaska, but retired to Tecate because it’s cheaper and life moves at a slower pace. He told us where Bar Diana was, and admitted he didn’t know a restaurant called La Fonda. He asked another old man: “Jarocho, Sabes el restaurante La Fonda?” The man thought for a moment and then gave directions in Spanish. “I don’t know it,” he tells us, “but my friend says it’s two blocks up the street.” We thank him and as we’re walking away tell him we’re actually looking for Daniel Reveles. He doesn’t recognize the name at first, but then tells us he knows who he is, that he often sits in the plaza, but he hasn’t seen him yet today. I start to think to myself that it was silly to think we’d be able to just show up in town and magically find Daniel Reveles, that he’d be just hanging out in the plaza or drinking in the bar. But I’m consoled by the conversation with this man, that he was nice and friendly and wanted to talk with us. Even if we don’t find the author it won’t be a wasted trip to Tecate. Walking into Bar Diana, a bar that the man in the plaza described as “A small, family bar”, its small, with only a few people inside. Looking over at the three men to my left I think I recognize the one in the middle. It’s been about five years, but I’m pretty sure that’s my old english teacher, the teacher that introduced me to Daniel Reveles’s books. We sit down at the bar and Kinsee asks the bartender about Daniel Reveles. He says he knows him, but hasn’t seen him yet today. The next thing I know one of the men beside me is saying to his friend, “They’re looking for Reveles.” I look over and say hi, and introduce myself and confirm that this is indeed my old English teacher from five years ago. He’s there with two friends and colleagues of his, also from the English department at Grossmont College. Introductions are made and the next thing I know the bartender is handing Kinsee the telephone. After a few minutes she rejoins us and tells me Daniel Reveles will meet us here in a few hours. We drink beer and tequila and chat while watching both American football and European football on the televisions above the bar. A group of musicians come in and we’re told that the guitar player is a character in one of Daniel’s stories. After a while the English teachers leave to have some dinner, telling us they’ll be at a restaurant next door if we’d like to join them. After a few minutes an older man walks in the door and the bartender seats him next to us. Daniel Reveles introduces himself to us and orders a tequila straight, with limes on the side. We talk for a while, about Tecate, about his life experiences that brought him to Tecate to be a writer of English language fiction. He tells us he names his books after food because the short stories are like a combination plate, with a little bit of everything. After talking a while longer we tell him his friends, the english teachers, are next door and were looking for him. Soon we all migrate the the restaurant and I hear the story of how the English teachers from Grossmont college discovered Daniel Reveles at an old bookstore out in Rancho San Diego (a bookstore I used to frequent some years ago, run by an amazingly nice woman, which is gone now). I heard some more stories and soon it was time for them all to leave. Before leaving town Kinsee and I stopped by the plaza again. It was dark now but just as lively as it was in mid afternoon. Kids were still running around playing, people were singing and dancing around the gazebo. After taking in the scene for a little while we head back to the car. It was dark and we were tired so I decide to take the toll road home. It was quite a bit faster, but a lot more expensive, although the free road at night might be a bit hard to navigate. I walked away thinking Tecate is just as mystical and magical as the stories Daniel tells in his books.